a special tradition for many, perhaps a new tradition for some. sprinkled with herbs and steeped with tea! This colorful box of instant Matcha Latte, a gift from Mikako, has taken matcha to another level. Matcha is powdered green tea, typically used in the Japanese Tea Ceremony. Because of its excellent health benefits, it is becoming increasingly popular. As its popularity increases, it is also becoming more readily available. Since it has an ability to blend well with dairy based products, it has been introduced into the market as a tea latte, available at Starbucks. Easy to prepare, this fine powder is simply added to the cup along with hot water. Stir and enjoy. When hot, the sweet and creamy flavor of the powdered sugar and milk predominates the green spinachy taste of the matcha. As it cools down, the matcha green tea flavor seems to develop. It is a pleasant treat and interesting way to enjoy matcha green tea. Tasty and flavorful, and brilliantly green, I'll savor these little packets of Matcha Latte, dreaming of a future visit to Japan. Might even have to visit our local Starbucks to see what they offer! Has anyone sampled Matcha Latte from Starbucks? Hope your celebration was merry! A gift package from my penpal in Japan typically arrives around this time of year. It's always exciting to receive a box full of surprises from Mikako as she manages to tuck a wide assortment of goodies into the box. This year, the box contained a beautiful assortment of Matcha flavored treats. Micky says that 'recently, matcha sweets are very popular'. First to be sampled were these chocolate enrobed green tea cookies. Individually wrapped and packaged in this pretty box, it was hard just to sample one (well, two). The green tea flavor was delicate, the cookie very crisp, and the chocolate flavor (Van Houten chocolate) intense. These will be added to our cookie plate when the family gathers for the holiday celebration in a few days. The box will be saved and placed on display in the tearoom! Only a few special events remain until the holiday teacups are packed away for another year. Take a minute, select a cup, and let me pour you some flavorful Holiday Tea. Cherish some quiet time and peaceful moments before the festivities begin. Hope you are completing all your responsibilities and are able to enjoy a relaxing cup of tea. Bake cookies! That's what you do on a snowy day! The kitchen is fragrant with the delightful scent of holiday spices... cinnamon, cloves, ginger, and nutmeg ~ an unbeatable combination of spices, and essential to the Gingerbread Boy & Girls that we make this time of year. These cheerful little guys bring a smile to everyone! And the recipe happens to be one we have been using for just about the 40+ years The Rosemary House has been in business. One year, these guys and girls gaily decorated the Christmas tree we had on display in the shop. Such a festive sight! Thanks to friend Dennis for the newest holiday teapot. Happy to add it to the collection! And, if you would like a copy of the Gingerbread Men Cookie recipe, compliments of The Rosemary House, send us a self-addressed stamped envelope, and we'll put a copy in the mail to you, or if you happen to be in the shop, simply ask for a copy! Our mailing address: 120 S. Market St., Mechanicsburg, PA 17055. We can't eat it fast enough! Combine milk, sugar, and vanilla. Quickly beat in snow until consistency is similar to ice cream. Serve with chocolate sauce and enjoy! In the mood for a holiday tea sandwich? This little treat is made by combining freshly minced parsley and finely chopped radish. Soften cream cheese with a touch of mayonnaise and mix with a herbal seasoning. 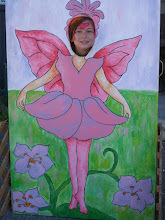 I used Aunt Hildegard's Divine Dip, a zesty and flavorful Rosemary House special blend. Spread the cream cheese on a piece of bread and then cut it into smaller squares. Top with parsley and radish, perfect red and green for the holiday season. If you have a small cookie cutter, cut out festive shapes to use as the top. I recently found this cute little tree cookie cutter and have enjoyed using it this year. Serve proudly! We welcomed Eliza Blackwell Dupree to the Christmas Carol Tea this past Tuesday where she shared the tale of Charles Dickens A Christmas Carol as told by Scrooge's sister, since she was, after all, present for the spirited visits. She told the story well, fully in character and not missing a beat! Her enthusiastic retelling held us all enthralled. Her graphic descriptions of the Spirits captured our imagination. Everyone left physically filled by the delicious tea prepared by Nancy Reppert and emotionally filled and in the Spirit of Christmas by Eliza's (and Charles Dickens') tale. "We Wish You a Merry Christmas". We have been creating herbal sugars for as long as I can remember. Another quick and easy herbal craft for gift giving, why not try your hand at making some herbal sugar. You are only limited by your imagination. Some of the traditional flavors we've made over the years include Vanilla sugar, Orange Cinnamon Spice, Lavender Sugar, Peppermint Candy Sugar, Scandinavian Spice Sugar, and on and on the list goes. The measurements are quite loose. To the amount of sugar you want to make, add a drop or two of food coloring (the more you add, the darker the color... we prefer only a hint of color, so only use a small amount of coloring), add some herbs or spices (these must be dry) and whir it all in a food processor until blended. Package in assorted recycled glass jars and add a bow or little lace topper and a label of course. This is a perfect gift for the tea lover on your list, or the person who has everything. Something useful from your kitchen, and hand crafted is a gift sure to please everyone. It is not too late to make this quick and fun gift from your kitchen. We used an organic white rice and added dried herbs to it. We might suggest a combination of Parsley, Marjoram, Tarragon, Thyme and of course garlic. A good proportion is about 3 T of herbs to 1 C of rice. Of course, you can use any combination of herbs that appeals to you. Italian flavored: Oregano, Marjoram, Basil, Thyme and garlic. A Cajun Rice blend sounds yummy. We did a sweeter rice this year with Rosemary, Lavender and Lemon Grass. Place the mixed herbs and rice in canning jars, create a label with cooking directions and present with pride! to be jolly! We gathered around the dinner table last night and made Chocolate Mug Cakes! We each had our own large mug, added the required ingredients, stirred, and mixed, and wondered about the results. To our surprise, we ended up with a quick (3 minutes in the microwave) chocolate mug cake! Pour liquid ingredients into coffee mug and stir together until combined. Microwave on high for 3 minutes. The cake will rise up over the top of the mug, that's okay. Cool a minute and enjoy directly from the mug or remove from mug to plate and enjoy warm cake with ice cream. Yum! 'Tis the Season! The second table top Christmas tree in the tea room sits in the front parlor, in the family heirloom, an antique German music box. Just as the tree rotates in the music box, the decorations on this tree change annually. Last year it was full of bright red cardinals, this year, still with touches of red, it is ornamented with large golden poinsettia blossoms and rich golden bows. Alas, the picture doesn't seem to capture the elegance of this simple tree. Oh Christmas Tree, Oh Christmas tree, How lovely are your branches! Oh Christmas Tree, Oh Christmas tree, You are the tree most loved! How often you give us delight In brightly shining Christmas light! That hope and love will ever be The way to joy and peace for me. Oh Christmas Tree, Oh Christmas tree, Your beauty green will teach me. Who laughs this way? Ho! Ho! Ho! Santa laughs this way! Ho! Ho! Ho! 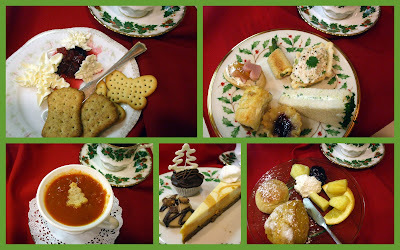 The culinary Santas, a unique collection, grace the hallway of the tea room this time of year. Their cheerful smiles and jaunty poses hint at the activities that take place in the kitchen on a daily basis. Pouring tea, rolling gingerbread, baking cookies, and crashing dishes... just a few of the goings on around here. These two little guys, the international collection, are perched quietly on the oak side by side. They are subtle reminders of vacations past. The smallest Santa is a souvenir from Spain, purchased too many years ago to remember, and the rotund Santa is a purchase from a recent trip to Germany. Sweet remembrances tucked here and there! We have been having fun with these delicate and fragile yet festive white chocolate trees this holiday season. They are ever so easy to do... simply melt a small amount of white chocolate, or dark if you prefer. Put the melted chocolate into a parchment triangle, snip the tiniest whole at the tip of the triangle, and draw the icing tree on a sheet of wax paper. In no time flat, you'll have a veritable forest of trees on the cookie tray. They keep well in the fridge to use as a garnish for your favorite dessert. Be forewarned tho, they are indeed fragile, so make some extra to keep on hand to quickly replace a broken tree. They're fun! 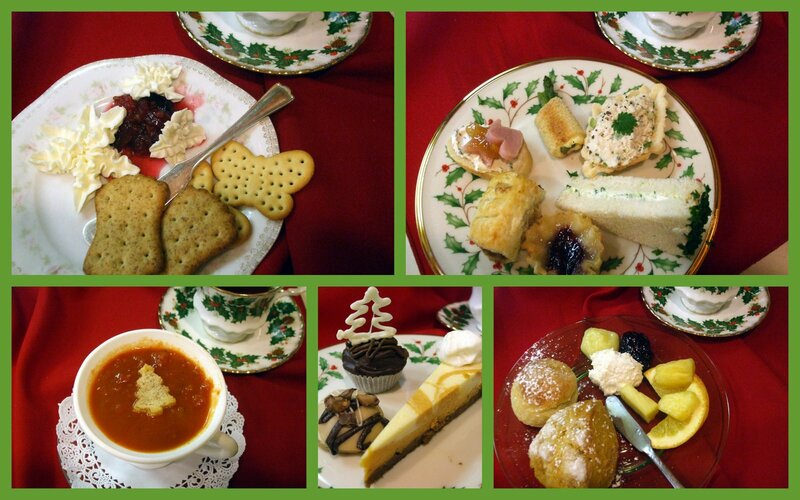 Every year the little table top Christmas tree decorated in only tea related items graces the tea room. It happens to be my favorite... I love every little tea ornament on that tree! At the base, a colorful and whimsical tea pot fabric serves as the table covering and a few tiny tea pot collections and holiday novelty tea pots are tucked under the tree. Penn-Cumberland Garden Club held their annual Scholarship and Community Projects Benefit this past Monday. 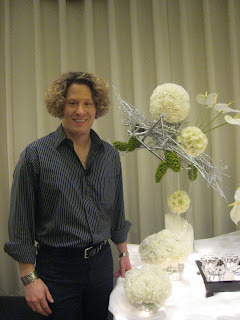 The speaker was Michael A Hasco AIFD and honors graduate of Pennsylvania College of Technology with a degree in Floral Design who has twice been a featured designer of the Philadelphia Flower Show. 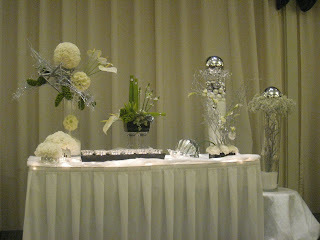 He presented a series of three vignettes of Holiday Decorating. Featured here is the Winter Techno Chic. Silvery and White with snow ball type orbs these striking designs are meant to carry you through the wintry months. 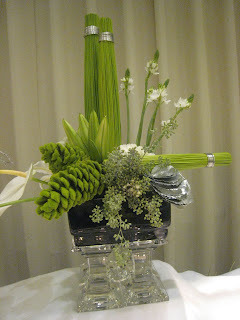 This vignette is called "Traditional" since it features the reds and greens commonly associated with Christmas. Above is a great wreath which gifted Michael Hasco wired to a sturdy picture frame! 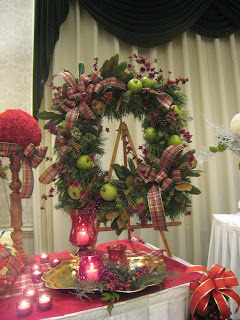 He has incorporated fresh greens, fresh fruit and some permanent berries into this fabulous wreath. 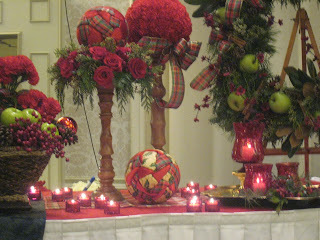 An inspiring combination of fabric orbs and also fresh carnation orb displayed on candlesticks. Skilled Mr Hasco has created these rather large vignettes but pointed out that as home owners we can use a small part on the dining room table, another section on the mantle and perhaps even put a touch of decorating in the bathroom. "We knew him when". This photo is from 1992, 17 years ago when Michael was in high school he worked in the back yard gardens of The Rosemary House. 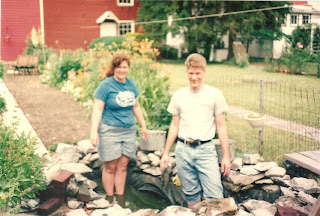 Always pleasant and smiling (even when cleaning the fish pond!) and also always creating clever plantscapes and pulling weeds with flourish we knew he was destined for greatness!